A lousy venue combined with awful sound and a 58-year old singer near the tail-end of a summer-long tour and you’ve got a recipe for a really bad concert. 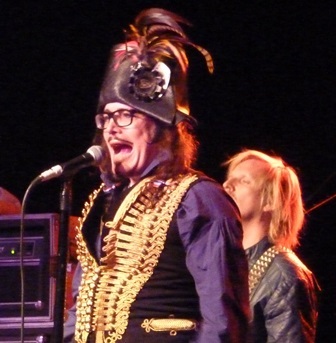 Englishman Adam Ant played a 30-song set that thankfully lasted under two-hours on Sunday night at the Roseland Theater in Portland and it sounded nothing like Ant music. Ant (born Stuart Leslie Goddard and officially changed his name to Adam Ant) wore his pirate getup, prominently displayed on the cover of 1980s Kings of the Wild Frontier album, for much of the evening. The showman he still is, with dancing and a stage presence that displayed a performer half his age. Subtle remnants of the youthful chiseled jaw remained but he’s lost the very feminine look he sported during his heyday. Eye glasses replaced the eye-liner which worked well, but for the most part, he looked more like a man in a pirate costume singing barely understandable songs. It’s not as if Ant lost his voice with age. 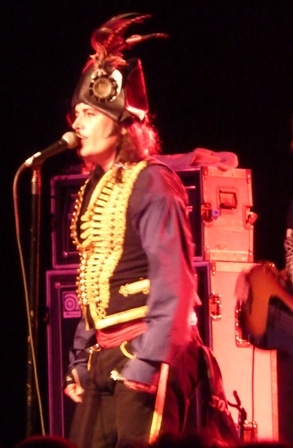 In fact, his latest album Adam Ant is the Blueback Hussar in Marrying the Gunner’s Daughter is a solid effort with some exceptional songs like the single “Cool Zombie” and “Marrying the Gunner’s Daughter.” That familiar Ant voice is clearly evident on all the tracts. However, the Portland show was the third in a row and fourth in five days. From the start the band sounded more or less like noise. Whether or not Ant’s voice was already shot is certainly debatable as the bass and treble sounded excruciatingly high forcing Ant to try in vain and yell over the guitars and drums. Gone was the vocal charm and melody that made Ant a hit in the early 1980s. None of his songs sounded anything like the studio versions. At times Ant’s voice was nearly drowned out by his band. “Marrying the Gunner’s Daughter” opened the set and it foreshadowed things to come as the follow-up “Dog Eat Dog,” a popular tune from Kings was barely recognizable. The B-side and very punk-rock sounding “Beat my Guest” managed to be a step-up but “Kick” was audibly worthless. Ant grabbed the guitar for “Ants Invasion” which was just OK and the hit “Stand and Deliver” started well but clearly showed Ant yelling through the chorus decimating any melody or rhythm that made the song so fun. His more debonair singling style proved no match to the thumping drums and blaring guitars. “Room at the Top,” the single from 1990’s Manners & Physique, was discernible only when Ant sang the title words. The best song of the evening was “Wonderful” which it was far from, but it did not require Ant to force so much of the vocals. Adam Ant deserves credit for banging out 30 songs – an absolute rare feat these days considering 20 songs for most bands is a lengthy setlist. The use of two drummers proved interesting and watching the two keep in perfect symphony with each other showed Ant picked some fine musicians to work with. But seriously, two drummers and not one could play the catchy intro to “Ant Music?” Instead Ant “sang” it. It’s hard to complain about a generous song performance, however, considering his age and the pace of the tour, but mostly that at least half a dozen songs just were not worth playing live, Ant could have slowed the pace a bit. In a recent interview he said performing his shows was like a marathon and indeed he looked at times like he had just finished a lengthy sprint before stepping on stage. What’s more, the stripped-down set with no synthesizers for much-needed additional effects added greatly to the detriment of the songs as they sounded more like bad covers than those sweet radio-friendly tunes. This isn’t to say the entire evening was lost. “Strip” and Desperate But Not Serious” were somewhat listenable and “Car Trouble” clearly had potential. But “Whip My Valise”, “Never Trust a Man (With Egg on His Face), Xerox and Cleopatra added to an already bloated setlist. It didn’t matter much anyway as halfway through the show most songs simply turned into white noise.